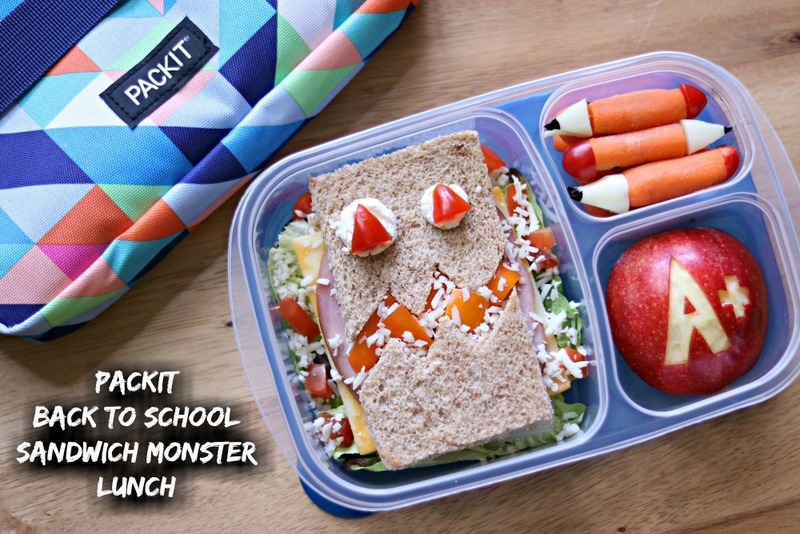 Lunchbox Dad: Make a PackIt Back to School Sandwich Monster Lunch! Make a PackIt Back to School Sandwich Monster Lunch! This is a sponsored post in partnership with PackIt. All opinions are my own. It's back to school time which means it is time to start making lunches for your kids again. It seems like every school year you start out with good intentions, but then life hits, and you forget all about those plans you had. I know, I've been there. Well hopefully I can help you to start out the year with a little bit more fun in your kids' lunchboxes. In my family, just making one fun lunch a week for my kids helps them to look forward to Mondays at school and it helps bring us closer together. So today I want to help you to make a Back to School Sandwich Monster Lunch in a PackIt bento box and freezable lunch bag. I really like PackIt bags because they remove the need for extra ice packs. You just pop the bag in the freezer overnight and the built-in freezable gel will keep food cool for hours! By morning the walls of the bag will be completely frozen and ready to chill your kid's lunch, just like a fridge. It is super convenient. 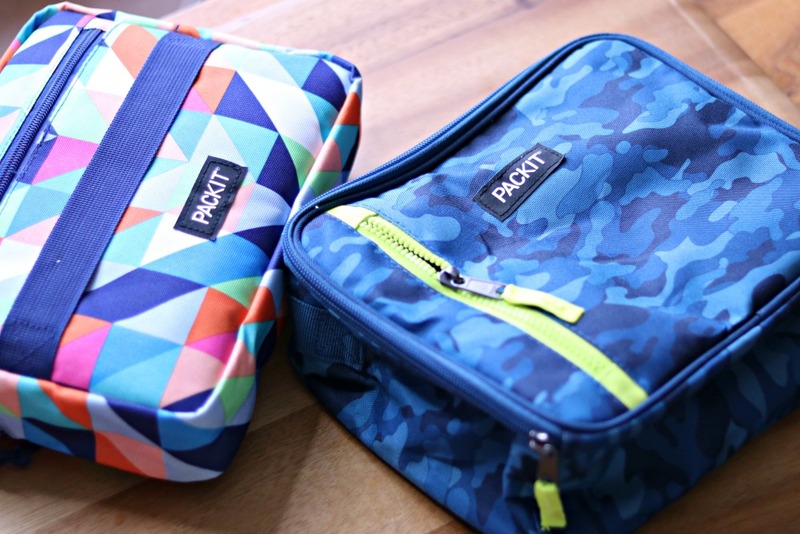 Their new line of bento boxes also helps make it easy to pack healthy meals for your family. So if your little monsters are ready for school (and you are as well), why not make the beginning of the year a little more fun by building this sandwich monster lunch for them? Here is how to do it! Ingredients: 2 slices whole wheat bread, orange sweet peppers, grape tomatoes, cream cheese, sliced cheese, sliced lunch meat, lettuce, shredded white cheese, baby carrots, string cheese, black food coloring, half an apple. 1. Place lettuce in main compartment of PackIt lunchbox. 2. Cut slice of bread into a rectangle. Repeat with second slice. Make a jagged cut through the center of one piece. Place cheese and meat on bread that is not cut in half. Top with both pieces of jagged bread. Place sandwich on top of lettuce in main compartment. 3. Slice peppers into thin strips. Place pepper pieces between pieces of of jagged bread to make a monster mouth. 4. Place two balls of cream cheese on top of monster sandwich for eyes. Cut two triangle pieces of tomato and place on top of cream cheese. Drop more pieces of tomato on top of lettuce. Sprinkle shredded cheese over monster mouth and lettuce. 5. Cut piece of string cheese into a small triangle shape. Cut grape tomato in half. 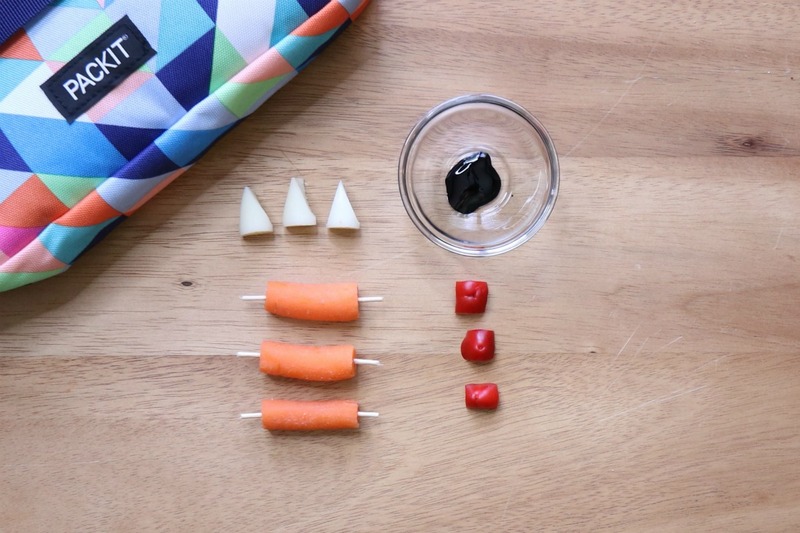 Poke toothpicks into each side of a baby carrot. Place triangle string cheese on one side and tomato half on the other. Dip end of pencil carrot into black food dye. Repeat two more times to make three pencil carrots. 6. Place other baby carrots into side compartment. Top with carrot pencils. 7. 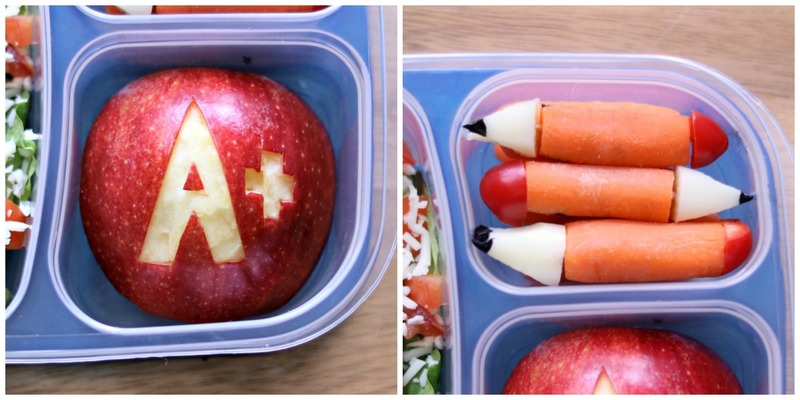 Make a shallow cut in a red apple half forming an "A+." Place in other side compartment. Optional: Rub lemon juice on apple to prevent browning.